For new chicken owners, winter can be a scary time. Will they be warm enough? Will they keep laying eggs? These tips will keep your hens happy and healthy. I've often gotten questions about putting a heater in the chicken coop for winter warmth. My answer: don't do it! Think of all that bedding - you're asking for a fire. Plus, chickens don't need it. They huddle together for warmth. And don't seal up the coop completely. Ventilation is key to prevent moisture buildup. The deep litter method is a way of allowing bedding material and chicken poop to build up in the coop over the spring, summer, and fall so that by winter you have roughly a foot of composting material on the floor of the coop. This composting poop and bedding will give off its own heat, warming the coop naturally. Some birds are great layers right through the winter. Our Buff Orpingtons seem to lay no matter how short the days. But in general, supplemental light is required if you want to keep your family or customers in eggs all winter long. However, there are some downsides to supplementing light - it stresses the birds and can shorten their laying life. So consider both pros and cons. Giving your chickens a nice feeding of cracked corn before bed gives them something to digest during the night, keeping them warmer. And they love it, and who doesn't deserve a little extra niceness during a long, cold winter? 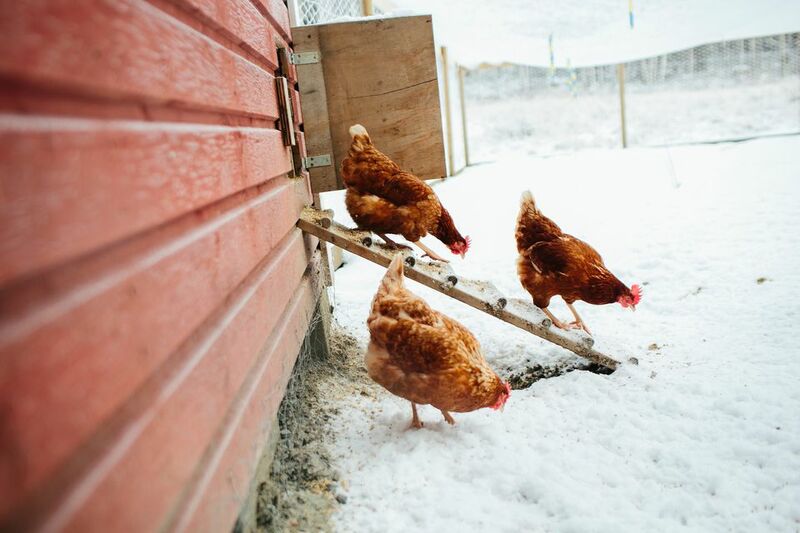 Just like humans, chickens can get a little bored and stir-crazy in the winter. They sure seem to like it when I hang a head of cabbage on a string in the coop. They go wild pecking at it while it bobs around. It makes me feel like I’m doing something for them, anyway. So try it - keep your hens happy! If you’re worried about your girls not having enough space in the coop, you can build a kind of cold frame or greenhouse style addition to your coop, covering it in clear plastic. They will wander out into it and have a bit more space on nice days, and you can rest easy knowing they aren’t too smushed and are getting some fresh air. In the coldest winter climates, you may find that breeds with large combs and wattles are prone to frostbite. To protect them, you can smear their combs and wattles with petroleum jelly. However, if your chickens do get frostbite, it is usually just the tips of the combs that are affected, and they don’t seem to be any worse for the wear - but it can look a little icky. Generally speaking, once temperatures are in the 20 degrees Fahrenheit range, chickens (mine, anyway) won’t walk out into the snow. You can scatter hay or straw on the ground and this will make it more palatable for them. And I find when it’s in the low 30s, they don’t seem to mind walking on the snow as much. They know what to do. If they don’t want to be outdoors, they will head into the coop. Just let them do what they want. They are hardier than you might think, and aren’t as averse to cold as people often think they are. Don’t waste your time and energy trying to shoo them indoors in the rain or snow. Chickens will roost together and fluff themselves out. This is what keeps them warm. It also keeps them off the cold ground. So make sure you have plenty of space for all your chickens to comfortably roost (check on them in the evening with a flashlight - if someone’s on the ground, there’s not enough space). Roosts should be at least two feet off the ground.